No matter who you are, floating can make you feel better. For some, floatation therapy provides the ultimate in relaxation and recovery; others turn to floating to boost creativity and visualization; for everyone, floating offers a welcome rest from the hustle and bustle of the modern-day world. No phones, no deadlines, no commitments, no traffic – no stress. Cortisol, a “fight or flight” hormone, floods the body during times of stress. The Epsom-infused salt water in our tanks helps replenish the body’s natural supply of magnesium, thus reducing cortisol levels and easing the symptoms of anxiety and stress. As you may have guessed, one of the most common causes of insomnia is stress. The deep relaxation of an isolation float tank allows our nervous systems to rest and re-set, which leads to a better night’s sleep. The best part? The more you float, the deeper and more positive the effects. Without gravity, your body is relieved of all pressure and contact points, allowing your blood vessels to fully dilate. This instantly reduces blood pressure and maximizes the delivery of blood, oxygen, and red blood cells to your entire body. This Epsom salt treatment also helps your body to replenish magnesium, thought to be a crucial element in reducing high blood pressure. NBA star Stephen Curry talks about how floatation therapy helps speed up his workout recovery and boost his performance. More and more athletes – including professionals like Stephen Curry, Tom Brady, and Olympic gymnast Aly Raisman – are turning to flotation therapy to take their games to the next level. Floating helps speed workout recovery, reduce lactic acid, and improve oxygen circulation. Because an Epsom salt bath has been a long-time friend of the recovering athlete, the Epsom-rich water of the float tank has become a “go to” workout recovery for many of today’s top athletes. 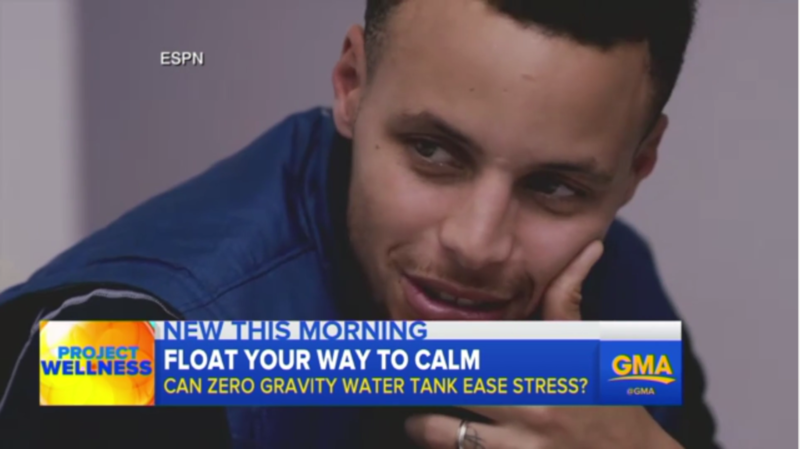 By improving concentration and focus and enhancing visualization, sensory deprivation tanks also allow athletes to perfect their “mental game.” In this video, Stephen Curry talks to Good Morning America about how floatation therapy helps maximize his performance. Epsom salt bath benefits include relief from sore muscles, pain and inflammation in joints, including symptoms of arthritis. An Epsom salt bath in a float tank takes this relief to the next level. Floating weightless in 1000 pounds of Epsom salt water reduces the lactic acid levels in your blood, thus easing pain and inflammation. Also, the profound rest and relaxation causes your body to release endorphins — the body’s all-natural “pain killers.” In this video, one of our Just Float members shares her story of how she was able to finally find a natural treatment for fibromyalgia through flotation therapy, relieving much of the pain. The health benefits of floatation therapy can last for days, weeks, or even months afterwards – and additional floats only heighten the effects. Ready to dive in? First-time floaters save $30 off their initial float. And if you don’t find relaxation your first time in, we’ll give you your money back. Guaranteed. 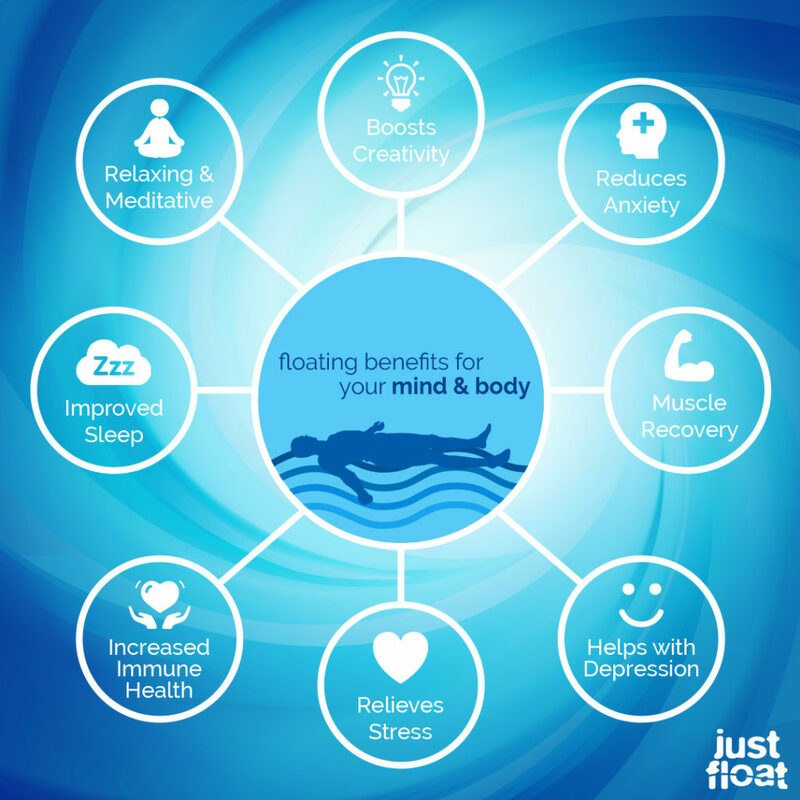 Has floating made a positive impact in your health and wellness? If so, we’d love to hear your story. The deep relaxation of an isolation tank is a great idea. It seems like flotation therapy would be a great service in order to get the rest and relaxation you need. Finding a flotation therapy service in your area could give you the ability to go whenever you need to in order to keep stress free and relaxed. Thanks for your comment about how float therapy is helpful in regulating your blood pressure levels. I like how you said that it can also relieve pain and swelling in parts of the body. My husband and I have high blood pressure, and we are considering lowering that through float therapy.